We the people have been known to take our eating habits to the extreme. From fad diets such as Atkins and South Beach, to having the highest obesity rate in the world, we either love to starve ourselves or strive to be the most gluttonous people on the planet. Let’s talk Turducken. A turducken is a turkey stuffed with a duck, stuffed with a chicken. 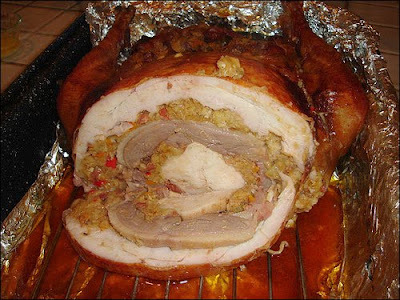 Turducken is the latest Thanksgiving craze and is on its way to becoming more popular than the much loved fried turkey. However, the Cajun concocted turducken has been around for quite some time, it has only recently become something to serve at the Thanksgiving table. The turducken is said to have been invented in the 1980s by famous chef Paul Prudhomme. According to Prudhomme, he first started making Turduckens in the 60s and began manufacturing the dish in the 80s. Today, prepared Turduckens sell from around $80-$115 dollars (not including shipping) and are increasingly gaining popularity around Thanksgiving time. If you are one of the many brave meat lovers in the world, you can make this “tri-brid” from scratch at home, as long as you have a good set of knives, an accurate oven and about 15 hours. And if you’re a vegetarian, PETA activist, or just plain faint of heart, please read on at your own discretion. First, you’ll need a 20-25 pound turkey, a five-pound duck and a four-pound chicken, according to Prudhomme’s recipe at Chef Paul's website. Next comes the blood, sweat and tears. You must de-bone all three of these birds because one of the unique things about a turducken is that you can slice right through it, unlike the traditional Thanksgiving turkey where you must cut around the carcass to get to the meat. De-boning the birds is difficult and only gets easier with practice, which is probably why many people choose to buy their turduckens. If cracking the bones of an innocent, dead bird makes you ill, check out cajunstuff.com for information on buying one. After you de-bone the turkey, the duck, and chicken will be much easier. When you have finally made all three birds boneless it’s time to concentrate on the stuffings. Yes, I said stuffings, with an s. A turducken wouldn’t be completely gluttonous without three different kinds of stuffing — one for each bird. You’ll need about 12 cups of dressing for a 25-pound bird. Chef Paul’s traditional turducken recipe requires andouille sausage stuffing, cornbread stuffing and finally, shrimp stuffing. The assembly of the turducken is the fun part. Laying the boneless turkey flat on a surface, thoroughly season with 1/3 of the seasoning called for in Prudhomme’s recipe. Pack the cold andouille sausage stuffing into the leg, wing and thigh cavities of the turkey, being careful not to overstuff, as overstuffing will cause the leg and wing to burst open during cooking. After packing the cavities, spread an even layer of stuffing over the rest of the meat, using about seven cups of stuffing so it’s about three-quarters of an inch thick. Next, place the duck, skin side down, on top of the dressing so that it lies evenly over the turkey and is about one-half of an inch thick. Rub with seasoning and use about 4 cups of the cornbread stuffing to cover the duck meat. Finally, lay the chicken skin side down on top of the cornbread stuffing, season and stuff with the shrimp stuffing (about 2 cups). Once you are finished stuffing smaller critters into bigger critters and cramming all three birds with stuffing, your next step will require a team effort. You’ll need two people to squeeze the right and left side of the turkey around the other birds like you do to your luggage when you pack too heavily for a trip; one to sew the bird up and try to make it resemble the turkey it once was, and another to hold open the oven door while the rest of you strong-arm your meal into a 190 degree Fahrenheit oven. The turducken will need about 12-13 hours of roasting time and about an hour to cool. So be sure to have a selection of appetizers on hand for your drooling guests. If you follow the recipe from Chef Paul, you can feed up to 34 guests. Having a larger party than that? In Texas, where everything is bigger, they have the pigturducken, which is, you guessed it, a chicken squeezed into a duck, squeezed into a turkey, squeezed into a pig. Turduckens are the newest in extreme cooking and because they are so challenging, they are so rewarding to eat. Although turduckens may not be suitable for the flavorfully or carnivorously challenged, your more adventurous guests are sure to eat it up. If you think you have the time, energy, strength and patience to take on a turducken, go to Chef Paul's website to shock, astonish or simply mortify your guests at your next dinner party. Oh my god! I had no idea you made a turducken!